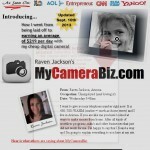 “My Camera Biz”, by Raven Jackson and found at mycamerabiz.com, is a Clickbank affiliate niche product that offers an online business startup course on how to sell your own digital camera photos. Selling photographs is not as easy as My Camera Biz may lead you to believe. Several photographers I know have informed me of just how difficult it can be even for seasoned pros. While it’s fairly simple and easy to post pictures on the web, getting paid for them is another matter. Much of the time, people just copy them and don’t pay you, much less tell you they take them. My Camera Biz claims they have a sure fire formula for helping you make a profit from your photography. However, after taking a look at it, I realized the information they provide can be found anywhere for considerably less than the $37 dollars they charge to join. Fortunately, My Camera Biz is a Clickbank product, so you are guaranteed your money back through their 60 day no questions asked return policy. There have been several filed complaints of people not getting their refunds through My Camera Biz so get your money back through Clickbank. There are more people on the internet selling this product than are actually selling their photos, so the affiliate marketing part of My Camera Biz may be a way of making some money with this system. Just lightly searching, I found many resources on how to build your own online photography business. About the only way I would recommend My Camera Biz is if you make it part of your niche marketing products for sale on your affiliate sites. The information on the site could interest others who might not want to do the research themselves, so it could be an interesting niche product to sell on your PPC banners, etc. My Camera Biz does not get you work, but steers you towards phone books and online job directories that you could find yourself without paying for. The sites My Camera Biz does middleman work for can be accessible on the internet for free. In the photography world, the reality is that you won’t really make as much as My Camera Biz claims you can make, and you certainly shouldn’t have pay or anybody else beforehand to submit your photos. Making money with My Camera Biz has proven to be very difficult indeed. They don’t provide successful users’ proof of payment, so taking them at their word is quite a gamble. Be careful of getting pressured into buying upsells from My Camera Biz. They are not covered by Clickbank’s refund policy and could be very expensive for little in return. Also, My Camera Biz may resell your personal data to their clients, who will spam your email to no end. Selling My Camera Biz as an affiliate may be difficult, as you have no conscience so you can benefit from newcomer photographers looking to be in business. It is not really a scam, but I won’t recommend My Camera Biz. At best, you are paying My Camera Biz for an eBook on entry level tutorials. Which can be found free online and the public library. My Camera Biz is full of hype on how much you can earn despite what their disclaimers say. Read those carefully before making any decisions to buy it. Maybe you might sell My Camera Biz, instead to other affiliates, as it is not a scam, but I don’t recommend it.